So do not fear, for I am with you; do not be dismayed, for I am your God. I will strengthen you and help you; I will uphold you with my righteous right hand. For I am the Lord your God who takes hold of your right hand and says to you, Do not fear; I will help you. I have been wanting to make today’s project for over a year now! I have been planting so much this year, so I decided why not do one more little garden! The 3 stacked herb pot gardens I have seen all over are normally made with pots you paint. Some of them use lettering to spell out what is in the pot. Since this garden was a last-minute add-on this year, I decided to keep it simple and not paint the pots. I do enjoy the natural look too! I looked at some directions online and they seemed more involved than I wanted to make my project! 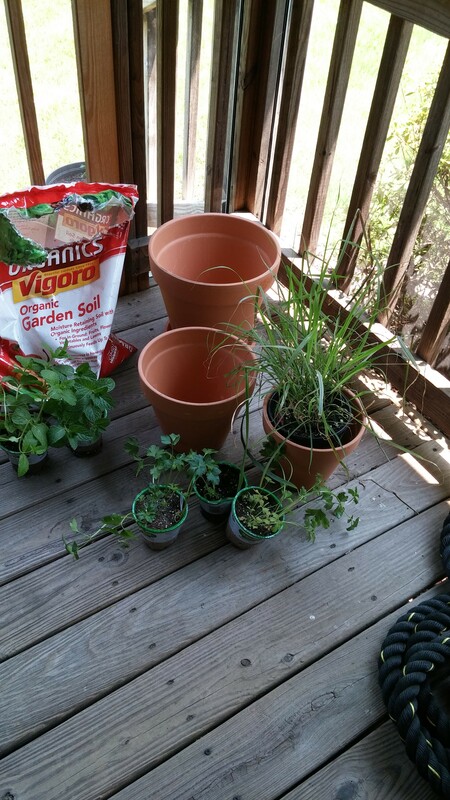 I simply purchased 3 clay pots, 3 different herbs and I had the good organic soil already. You can pretty much see how the project goes just by looking at the pictures. 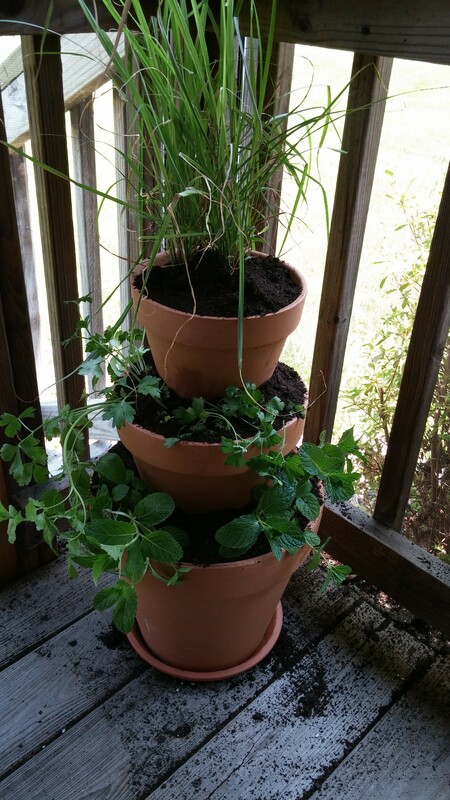 I added soil to all the pots about half way then I placed the medium pot in the larger, added more soil and my plants to the bottom larger one and continued my way up. My pots have not shifted at all and they look great! They are thriving and I am so pleased with this little garden! It sits on my porch and is very happy there! I used sweet mint on the bottom, italian parsley in the middle and lemongrass on top! I love these herbs! I use the sweet mint almost daily in my tea or on fruit salad. The parsley I use a lot in my cooking and I am working on trying to cut my lemongrass! I love the look so much, don’t want to cut it! Cutting it does help it thrive though!